Circa 1825. This turn-of-the-century Queen Anne Victorian inn offers 20 elegant guest rooms, including suites. Among the amenities in the air-conditioned guest rooms are antiques and fireplaces. The public rooms and halls are decorated with the innkeepers' collection of antique handbags and Wallace Nutting prints. The day begins with a bountiful heart-healthy breakfast. The beautiful Berkshires are famous for cultural and recreational opportunities, and guests can walk to shops and restaurants. Tanglewood is one mile away.Publicity and Awards: New York Times, Boston Globe, London Times, New York Magazine, Philadelphia Magazine, Target the Family.Location: Mountains, Small and resort town. Victorian Dreams, is often called the honeymoon suite because it is so romantic. A high four-poster queen-sized oak bed commands a great view of the corner fireplace (seasonal). Two comfortable wingback chairs complete the ambiance. A television is hidden from sight, but ready if you want it. The turret bathroom contains an antique soaking tub and a separate large tile shower. Bouquet, is a sunny room in the front of the house. Its walls boast big flourishes of flowers and three large windows to take advantage of the sun. A queen sized bed, Gothic Revival bedroom set, antique walnut wardrobe and romantic fireplace (seasonal) provide the perfect ambiance for relaxation and romance. The room has a private bathroom with a tile shower. Berkshire View is a large, sunny room with a four-poster queen bed and lots of windows. Its turreted sitting area has a wing back chair, antique English armoire, and a love seat that opens to reveal a single sofa bed. Enjoy fresh air and cool breezes from your private screened-in porch. The private bathroom contains a tile shower. Audubon, boasts a great high 4-poster king canopy bed, antique love seat and Victorian chair. The bathroom, one of two original to the building, has an antique claw-foot tub with shower. Heirloom, has a queen sized antique oak bed, two Victorian chairs and a Gothic Revival dresser. It has a private bathroom with shower. Arbor, one of our smaller rooms, Arbor has a queen canopy bed, skylight, and comfortable chair in the dormer, perfect for reading. Its private bathroom has a shower. Wildflowers, this newly renovated room, has an antique cherry headboard on a high queen bed and a cozy sitting area with gas fireplace (seasonal) and television. A small alcove with desk is perfect as a work station, for journaling or as a vanity. The room has a private bathroom with tile shower. The Tavern Room, one of our smaller rooms, was named in honor of the small rooms available for travelers in the early 1800&#8242;s. This room has a queen bed, two windows, a cozy dormer with a chair and table. It has a private bathroom with shower. Sunrise, this newly renovated room has a king bed (it can be converted to twin beds, if preferred), two comfortable chairs, a gas fireplace (seasonal), and television. It has a private bathroom with a shower. Rooms: This property has 19 total guest accommodations, 20 with private bath, 12 with fireplaces, 6 suites and 2 conference rooms. Cancellation: Prior to one month, 90% of the deposit will be refunded. If cancellation is made with less than 30 day's notice, the balance is charged. Whatever is re-booked, 90% of that amount will be refunded. Pets: Pets Allowed, Innkeepers pets on premises and First floor suite is dog friendly. Call for details. Types of meals: Vegetarian Breakfast, Snacks/Refreshments, Full Breakfast, Early Coffee/Tea, Continental Plus Breakfast, Continental Breakfast, Banquet Service, Afternoon Tea, We will make every effort to prepare a breakfast to meet special dietary needs and when notified in advance. Amenities In Room: Wireless Internet Access, Voice Mail, VCR, Television, Telephone, Refrigerator, Reading Lamps, Modem Hook-Up, Hair Dryer, Fireplace, Desk, Ceiling Fans, Bathrobes, Bath Amenities, Air Conditioning, Clock Radio, Cable TV, Free WiFi, Bottled water, Wine glasses, Bottle opener/corkscrew, iPod docking stations in many rooms and lap desks available upon request. Amenities On Site: Library, Child Care, Parlor Games, Phone, Fax, Fireplace, Limited Handicap Access, Television, VCR and Gift Shop. Business Traveler Amenities: Desk, Television, Modem Connection, Internet Access, Wireless Internet Access, FAX On-site, Iron/Ironing Board, Hair Dryer, Daily Newspapers, Gym Nearby, Off-site Dry Cleaning Services and Flexible Check in/out Times. On-Site Spa Services: Body Wraps, Fitness Center, Facials, Hair Care, Manicures/Pedicures, Massages, Nutritonal Counseling/Weight Management, Waxing and Yoga/Meditation. 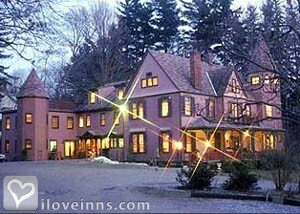 - One Night Free: This property is featured in Bed & Breakfasts and Country Inns published by American Historic Inns. This guide features a certificate for ONE NIGHT FREE with the purchase of one night. The dates this property will honor the certificate are Sunday-Thursday, Nov. 1-May 30. Subject to availability. Excludes holidays. Events Hosted: Seminars, Romantic Getaways, Family Reunions, Meetings, Honeymoons, Weddings and Innkeeper is a Massachusetts Justice of the Peace. Other Activities: Antiquing, Art Galleries, Bicycling, Canoeing/Kayaking, Fishing, Golf, Hiking, Horseback Riding, Live Theater, Museums, Parks, Shopping (Local Crafts), Skiing Cross Country, Skiing Downhill, Tennis, Water Sports and Wineries. Queen Anne painted lady. Built as a tavern in 1825 and moved to its current location in 1880.